LIC Jeevan Saral (Plan 165) – Details, Calculators, Review, and Illustrations. Jeevan Saral (plan 165) is one of the most ‘flexible’ and ‘feature rich’ conventional endowment type plan ever launched by LIC of India. Due to the high flexibility, it offers to the customer, it is often referred to as a conventional plan, with the flexibility of Unit Linked Plans. High insurance coverage and liquidity are the highlights of the plan. Please Note: LIC’s Jeevan Saral plan was withdrawn from sale with effect from 31/12/2014. And hence you cannot purchase it anymore. But all the policyholders who have purchased it before the withdrawal date will continue to enjoy the benefits of the policy. 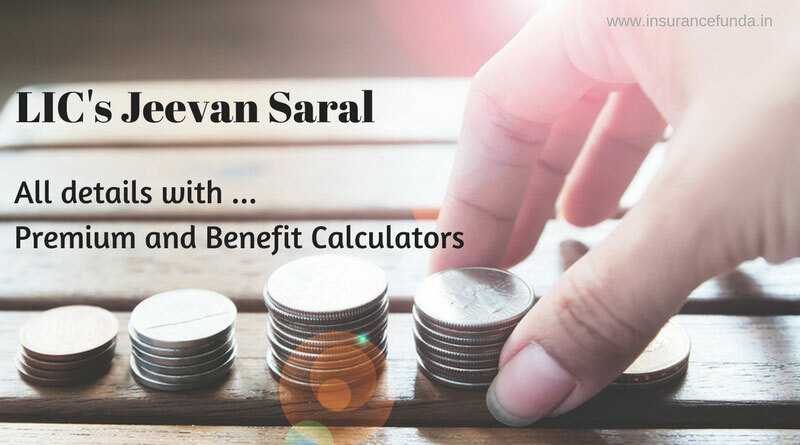 Premium and Benefits Calculator for LIC Jeevan Saral is a powerful tool to understand all the benefits of the plan in a simple and comprehensive way. You can provide parameters such as age, basic monthly premium, riders etc based on your own needs to get all the details of the plan including, insurance coverage surrender value maturity benefit etc. This online calculator can be used in mobile platforms also and do not need any installations. Click the button provided below to open LIC Jeevan Saral ( Plan 165) Premium and Benefit calculator. Generally in Endowment Assurance type of plans, Death Sum Assured will be equal or a multiple of, maturity sum assured. But in Jeevan Saral plan Maturity Sum Assured and Death Sum assured are entirely different entities. Death sum assured is defined as, 250 times basic monthly premium, whereas Maturity Sum Assured is calculated based on a table supplied by LIC of India. Maturity Sum Assured considerably varies depending on the age at entry. You can check the chart given below to understand the variation pattern of Maturity Sum Assured with age. From the above chart, you may notice the fact that lower age group people will get more maturity benefit compared to higher age group whereas the premium paid and the death sum assured remains same for all. The surrender value of the Jeevan Saral plan is the higher of Guaranteed surrender value(GSV) and special surrender value (SSV) applicable at the time of surrender. In order to understand the plan better, let us consider an example of a person taking Jeevan Saral Plan. Let the details of the person taking the plan be as follows. The Premium and the benefits of the example considered will be as given below. The Maturity Sum Assured of the plan is considerably higher, when compared to the premium paid, for the younger age group. In this example, you can see that the maturity sum assured is Rs. 8,45,480 whereas the total premium paid is just Rs. 7,68,640. LIC has declared loyalty addition rates up to a 17-year term and the loyalty addition rate shown here is as per the rate declared by LIC for the current year. The illustration shown here is based on the example considered. If you want to calculate the details based on your own details, use – Jeevan Saral – complete calculator. If you have any doubts or require more clarifications, drop a comment on the ‘Comment’ section given below.